Passable roads and homes and businesses under repair are signs of the progress made in the month since Irene’s floods hit. But there are also plenty of signs that work remains. community. Post your comments below, or email vermontedition@vpr.net. We talk with Mike O’Neill, director of Vermont Emergency Management about where response efforts are focused, and Brian Searles, Secretary of the Agency Of Transportation discusses the road and bridgework being done, and plans for redesigning some flood stricken highways. We also hear from Wilmington town manager Fred Ventresco about efforts to rebuild the hard-hit business district in his town, and Sarah Waterman of the Website #VTResponse gives us an overview of the volunteer work that’s still needed. Additionally, Stephen Woods, executive director of the Calvin Coolidge Memorial Foundation tells us the history of Coolidge’s "I Love Vermont" speech, which was widely quoted in the wake of the flood. And VPR’s Betty Smith has a flood story with a happy ending about a dog that went missing after Irene. Vermont transportation officials say that all state bridges damaged by Tropical Storm Irene have now been repaired or replaced, and that the state is very close to reaching its goal of opening all damaged roads by the end of the year. 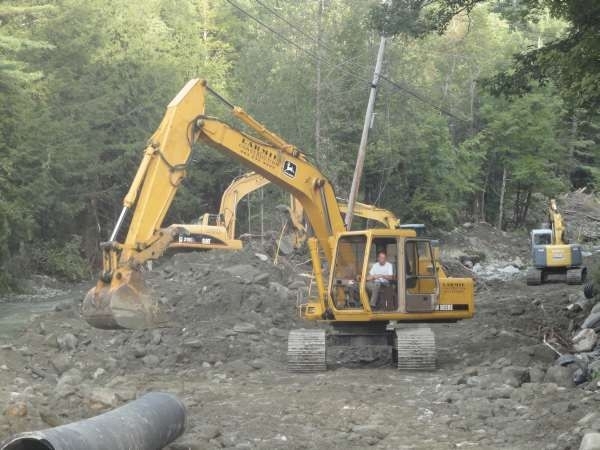 The repair costs to state roads and bridges damaged by Tropical Storm Irene continue to climb. The new projections come at a time when the state is trying to get a lot more federal money to help repair Vermont’s transportation infrastructure.